You are currently browsing the tag archive for the ‘Stunt Kite’ tag. The kite flying weekend continued with the regular Carolina Kite Club fly. We almost decided not to try to fly in the 2-3 mph winds. However, when we arrived at the beach, there was a large delta in the air with a spinner trailing behind it. 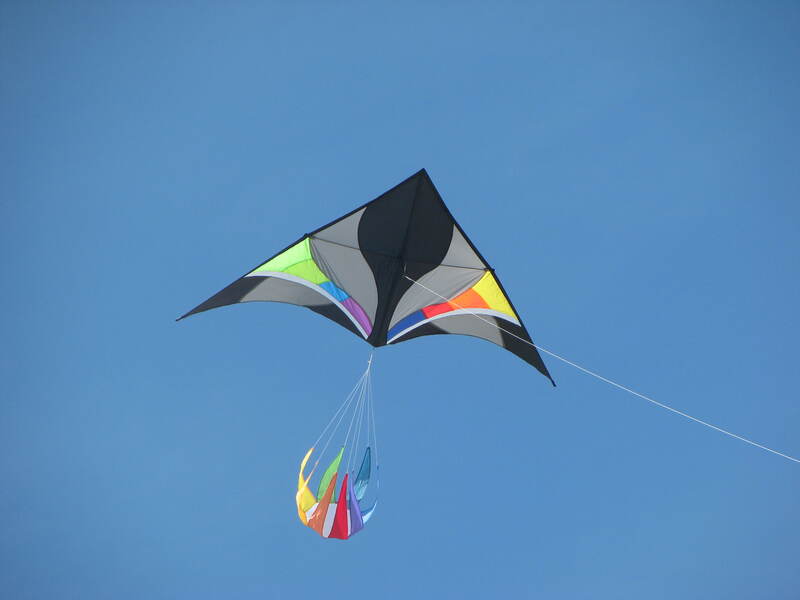 Logically, this kite should not have been flying in those light winds, especially with the drag of the spinner. But there it was. 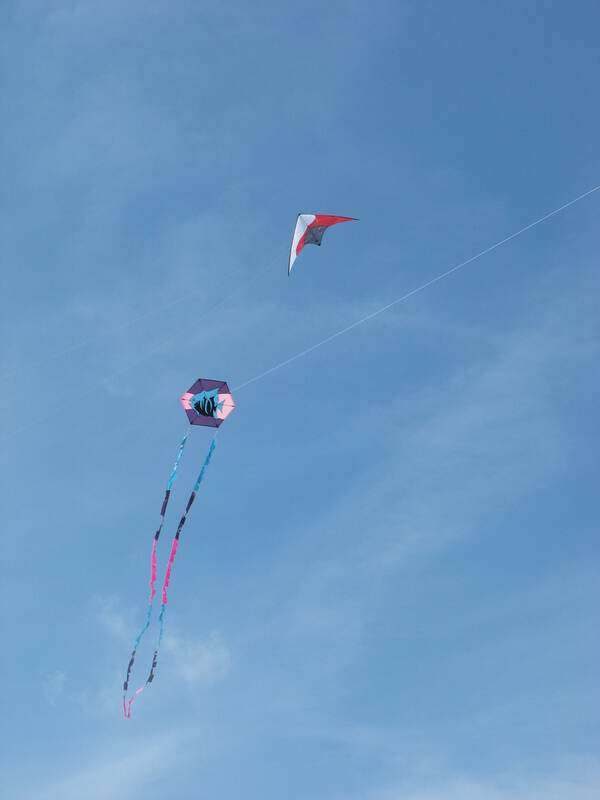 So we gathered up our light wind kites and went to join the other flier. To add to the amazing flight of the delta, it was flying on heavy line which was adding to the drag. Not to be outdone, other members of the club put up a RWB delta with tails and a couple of the Critter kites by Skydog, the Penguin and the Elephant. 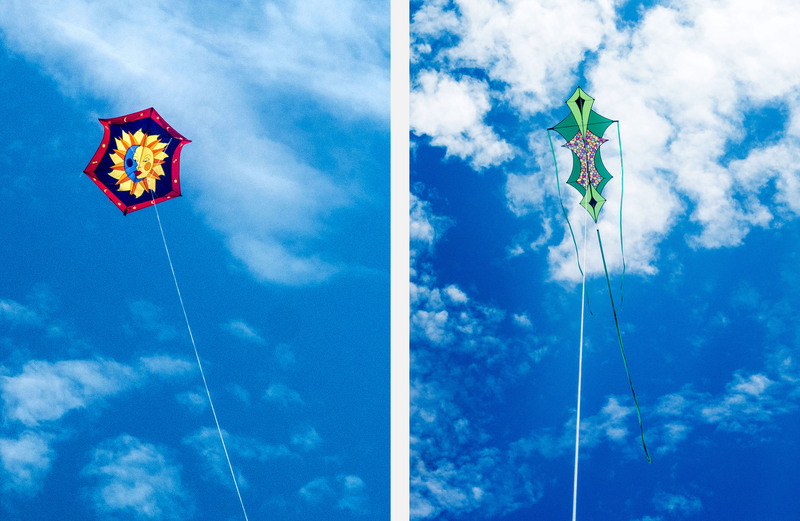 I got out a small six-sided kite that I made some years ago and my light wind Fled. 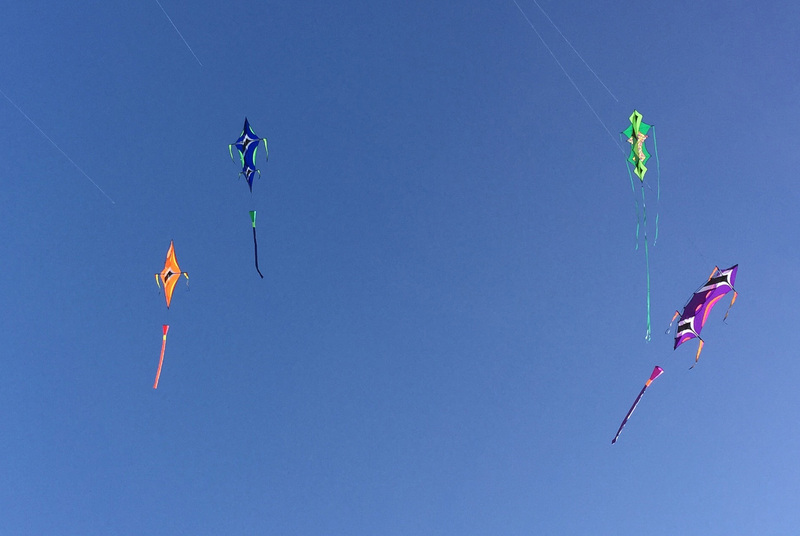 It took some work to get the kites up but once they were high enough, they flew pretty well. The Fled almost got away from me when a sudden gust of wind came up. 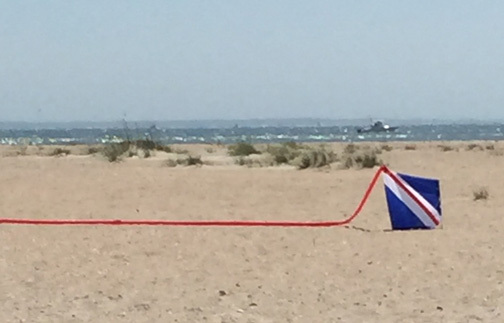 There was not enough sand in the bag anchor and the kite started dragging it across the beach. Then the wind dropped and they all fell down. Except for that amazing delta kite. Before leaving, Don from the Kites Unlimited Kite Shop brought out a small light wind stunt kite from Into The Wind called the Wisp II. This kite was just right for the 2 mph wind we had. At first it seemed too fast and twitchy. But once I lightened up on the lines, it was a blast to fly. 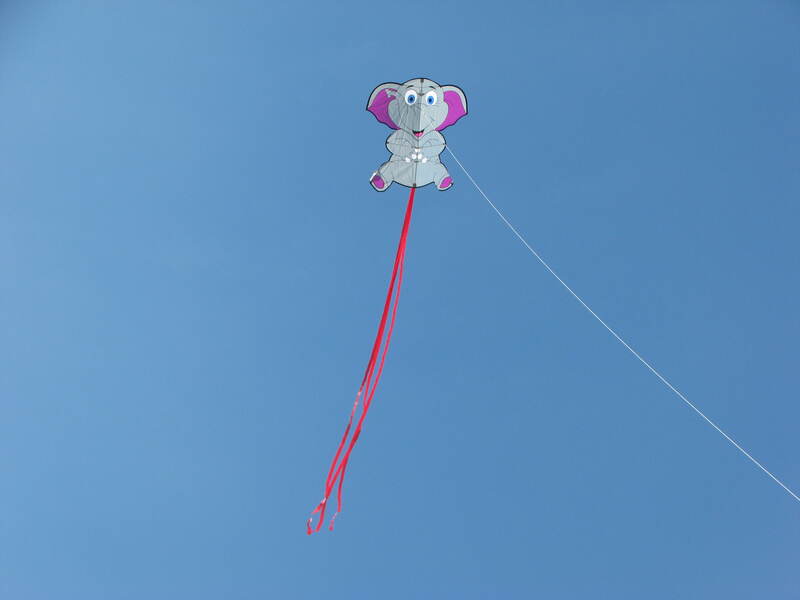 For a small light-weight kite, it tracked across the sky surprisingly well and only needed fingertip control. I guess you could say it was love at first sight. There is one of these on order for me and it will be a red one. 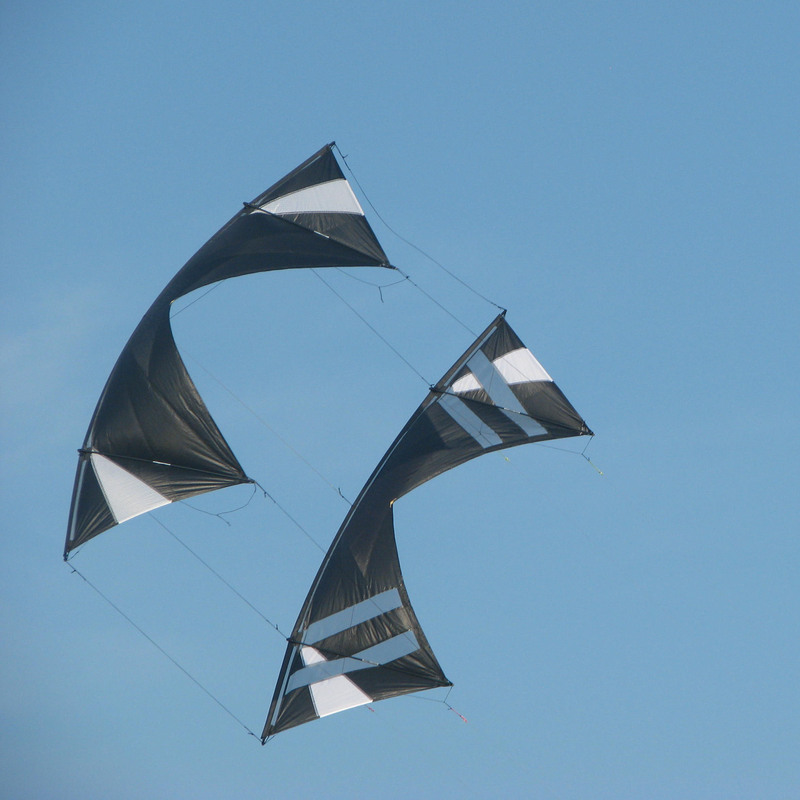 This week I am missing the Carolina Kite Club fly. But I had just finished the pigtails and train lines for a Revolution kite stack and really wanted to get out and try it. Yes, lately it seems I’ve been “stack” crazy. I stacked my Dream On and my Little Dreamer and added to my stack of Goblins. Now, I’m stacking quad line kites. I had seen stacks of Revolutions on photos from some of the large kite festivals. They looked like fun and a challenge. Not being an expert flyer, I decided to start with a small stack. 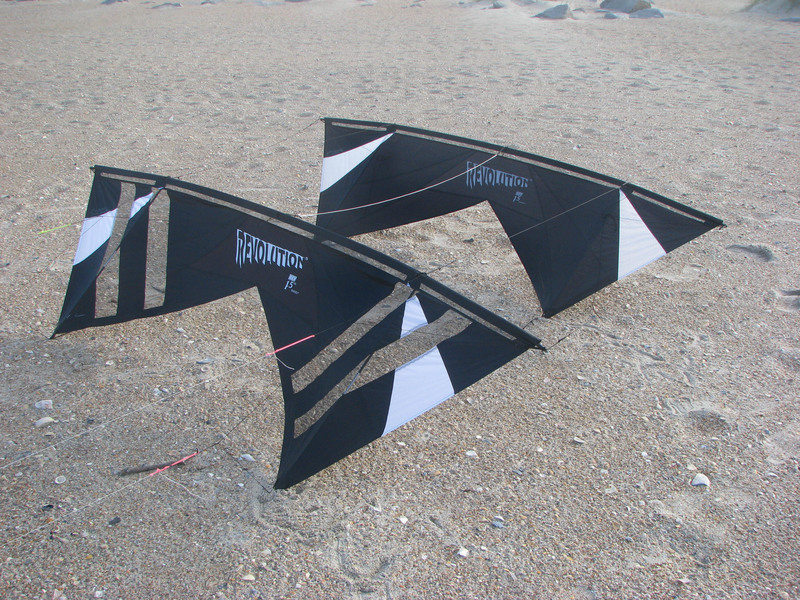 I have two kites that have the same sail pattern, the Kites Unlimited Custom Revolutions. One is a full sail and the other is a vented sail. So I went out one evening when the wind was about 10 mph and the temperature had gone down to something bearable. My mind was picturing tangled lines and ugly crashes. instead I had a wonderful time. The two kites flew as one with just a slight pull on the lines. The only time things got wobbly was close to the ground where the wind got a little light. And, even then, it was controllable. I’m looking forward to taking these out again. And again and again. And so said the Wicked Witch of the West in the Wizard of Oz. And that’s just the way I felt at our most recent kite club fly. Thankfully, I had brought a cooler with water and drank all that I had. Otherwise i probably would have become just a puddle in the sand. It was scorching hot but the wind was up and too good to miss. I finally had the opportunity to put the complete Xelon collection in the air. I love these kites. My only problem is that HQ did not put a tube tail on the fourth kite in the series. I added a streamer tail to match the two side streamers but it just doesn’t seem right. I’m thinking that sometime over the winter I’m going to construct a tube tail to match the other three and add it to the fourth Xelon. 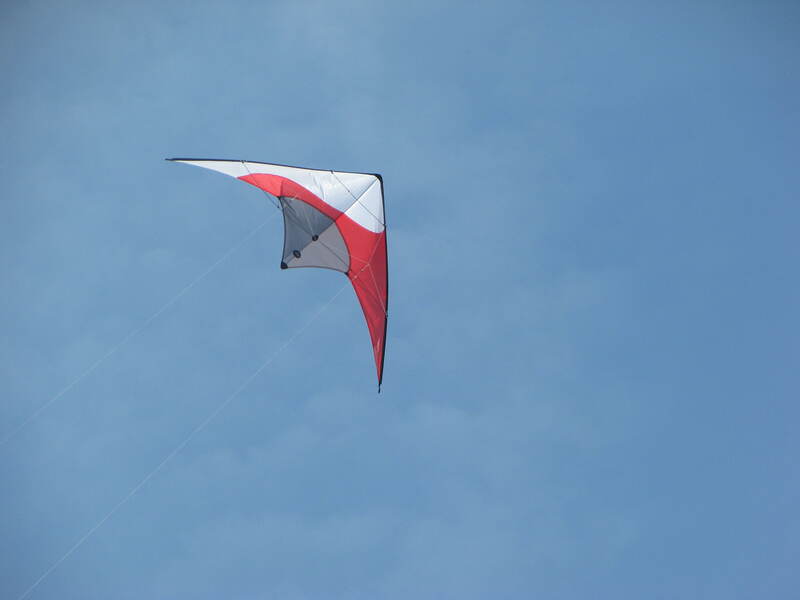 While the Xelons were flying, I put up my new Peter Powell stunt kite. 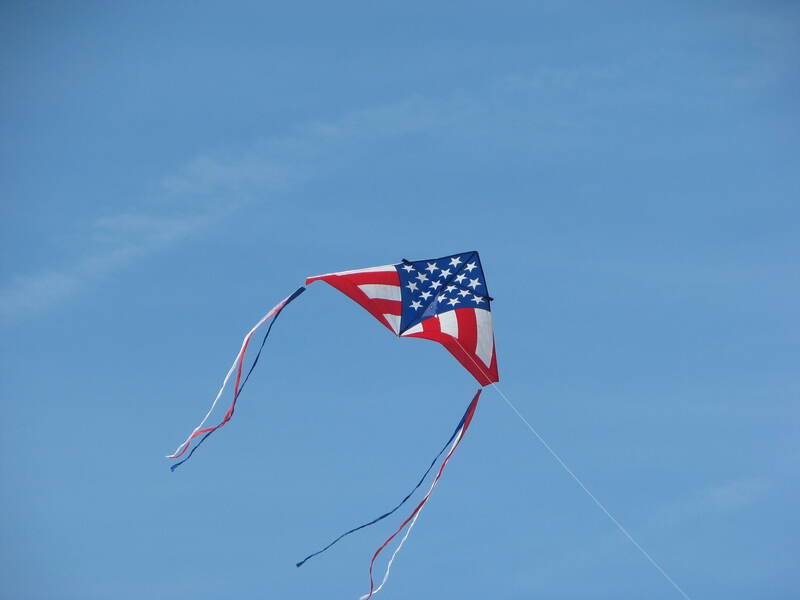 It was a perfect day for this kite. The diamond stunters need a little more wind to fly well and to have the long tails stream out behind them. The Peter Powell flew slowly across the wind window, doing graceful swoops, dives and circles. The tail tracing the kite’s path around the sky. My favorite type of stunt flying. Unfortunately, there was no one available to photograph this kite in the sky. So we have to settle for a landed Peter Powell. Nonetheless, it is still a good-looker. It’s been a week of firsts; first flights of new kites, first time on a new flying field, first visit at a new vacation location. First things first (sorry, I couldn’t resist). We recently got home from a visit to Corolla, NC. It was a restful time with walks around the Whalehead Club grounds, the historic village and the Currituck lighthouse. We also went on a safari to see the Corolla wild horses. And, of course, the trip included kites. We have some friends who have a kite shop in Corolla. We stopped in several times and I bought a new kite from them. A bit of history first. 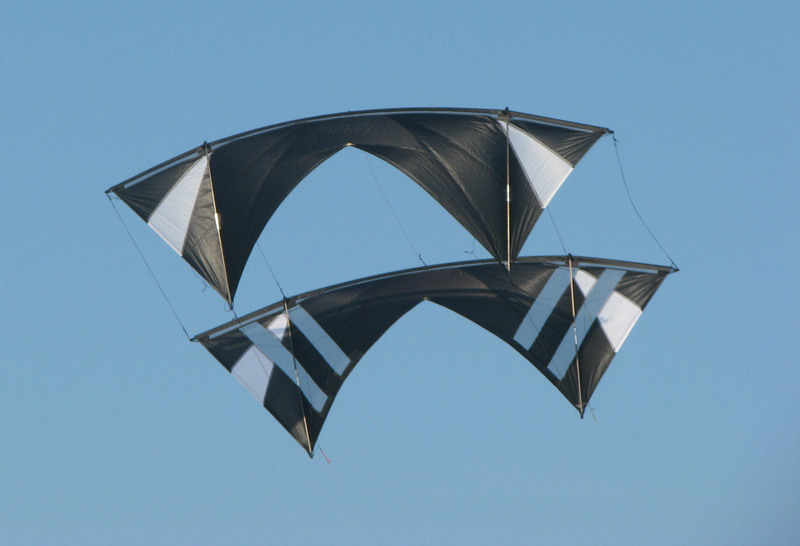 One of the first stunt kites developed was a diamond stunter made in England by Peter Powell. It was easy to fly and became very popular. It has been out of production for many years. But now, the grandchildren of Peter Powell have begun manufacturing the diamond stunter again, with only minimal changes from the original. 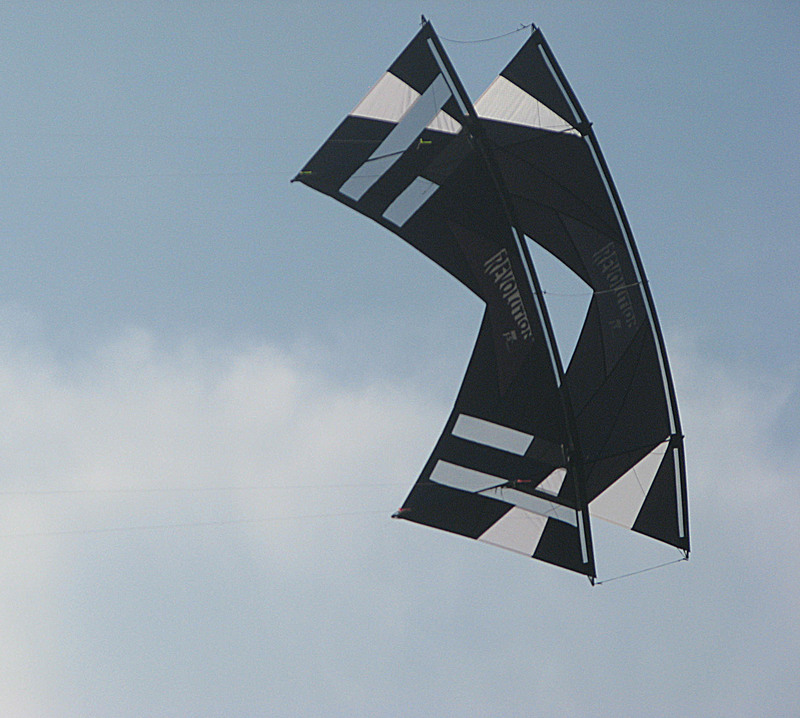 Our friends had one of these stunt kites in their shop and I’ve had my eye on it for a while. Well, I finally bought it and flew it on the beach at Corolla. Thus, a first vacation in Corolla, the first time flying a kite there and the first flight of the Peter Powell stunt diamond. I also scored a new kite on Ebay. It was a HQ rokkaku that has also been out of production for a few years – Sun and Moon. This kite had never been out of the package. It’s a smaller rok, only measuring about four feet tall. Monday was a beautiful day on the beach and the winds were about 12-15 miles per hour. I assembled the kite and it went up easily. The sun and moon motif looked wonderful in the sky. I also flew my large Xelon, the latest of four Xelons also made by HQ. I added some tails to this kite and it made all the difference in the flight and the appearance. I now have a complete set of Xelons and one day I will put all four in the air at the same time. It should be quite a show. 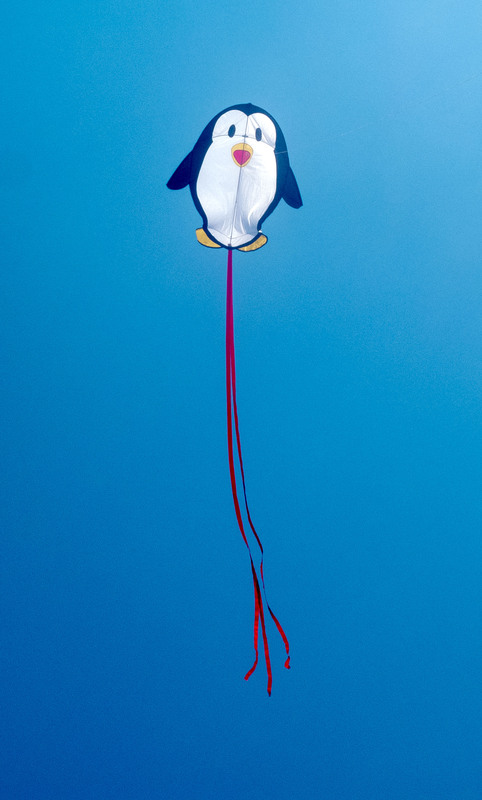 My husband flew his latest acquisition, a Skydog penguin kite. 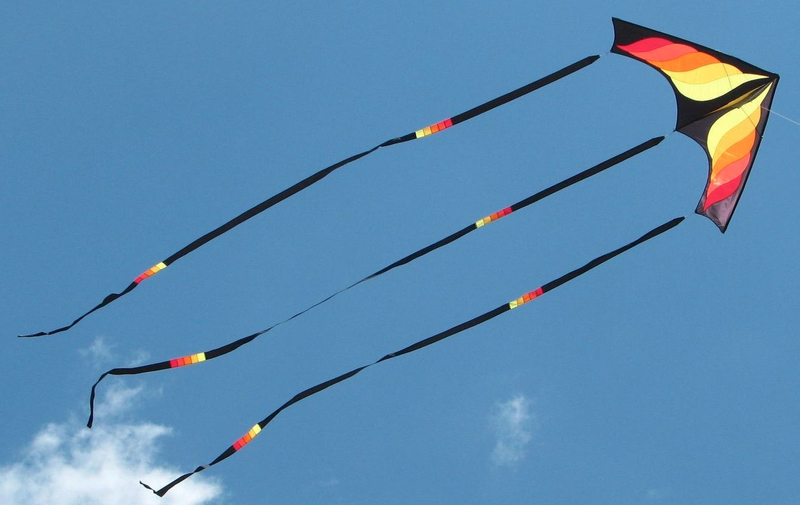 A really cute kite that flies well in a wide range of wind speeds. It is one of five animal kites that Skydog has produced this year. There is also an elephant, a monkey, a tiger and a panda. The elephant is definitely going to be added to our collection soon. We been acquiring a lot of kites lately. Probably way too many. But you can never have too many kites.